The Fashionable Supreme Court: Will They Say Yes to the Trade Dress? Designers in the high fashion industry face many obstacles in receiving intellectual property protection for the utilitarian aspects of their clothing. Congress has provided copyright protection only for original works of art, but not for industrial designs that embody utilitarian functions. See 17 U.S.C. 101. Copyright protection does not extend to utilitarian aspects of objects because it would open up a flood of litigation over exclusive monopoly rights that would “burden competition, raise prices, and also harm consumers.” See Star Athletica, L.L.C. v. Varsity Brands, Inc., Brief for United States as Amicus Curiae 5-6. This proves problematic, however, when art and industrial design are intertwined, especially in the fashion industry which combines aesthetic elements with utilitarian garments. Under the separability doctrine, these pictorial, graphic, and sculptural works on the design of a useful article are copyrightable so long as they “can be identified separately from, and are capable of existing independently of, the utilitarian aspects of the article.” See 17 U.S.C. 101. But what happens when pictorial, graphic, sculptural works are inseparable from the utilitarian aspects of a garment? See Star Athletica, L.L.C. v. Varsity Brands, Inc. provided fashion designers with newfound intellectual property protection for aesthetic aspects that are incorporated into utilitarian aspects of their garments. It is without a doubt that fashion, namely high fashion, has now become a status symbol that relies heavily on its branding and aesthetic more so than any utilitarian value its designs may serve. So much of the value that these high fashion designs derive is from its rarity and accessibility to only the elite and wealthy. Accordingly, it is not too surprising that fast fashion powerhouses have copied these high fashion runway looks along with several other brand elements available to the more general public. Fast fashion brands, i.e. Zara or Mango, have often tried emulating high fashion ad campaigns by recreating the featured garments for an exponentially lower price. For example, Celine’s ad campaign for the 2011 fall and winter collection consisted of models in a natural setting surrounded by aloe plants. 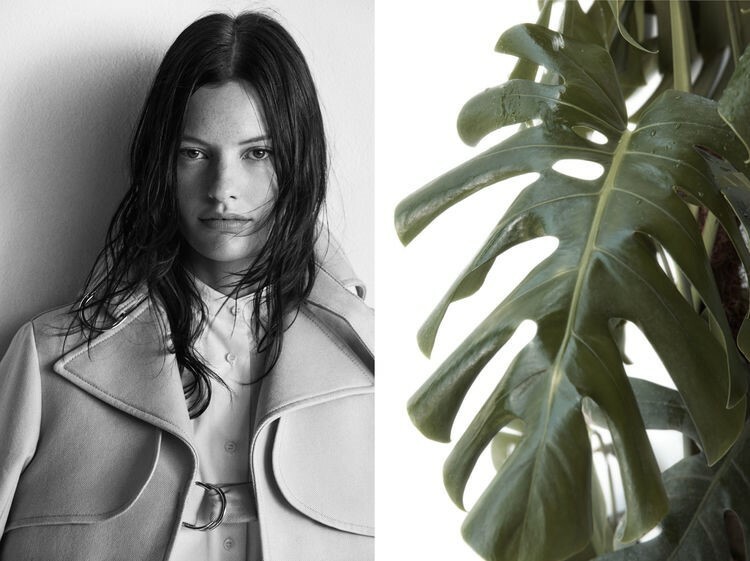 Zara later emulated this in black and white during the Spring and Summer 2014 season and again during the Fall and Winter 2015 season with a minimalist focus on a model in black and white and an aloe plant. 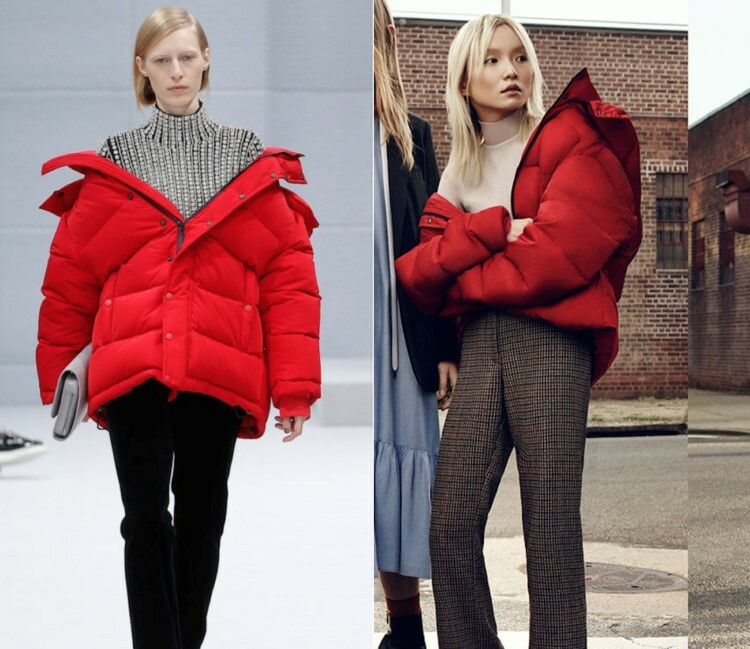 A few other examples of this are pictured below where Zara emulated Balenciaga’s Fall and Winter 2016 collection with its red parka and comparable styling to Lotta Volkova or a cream colored trench coat with athletic zip up wear underneath for the Burberry Fall 2016 season, which was a distinctive look for that season featuring model Chris Wu. The similarities between the campaigns are not entirely identical, and even if they were, there were not rigidly defined protections under the Copyright Act. Zara and other fast fashion powerhouses such as Mango and Forever 21 have a legally cognizable right to provide their own independent expressions about their fashion ideas. Accordingly, they continue to use these similarities with the intention that consumers create a psychological connection between the high fashion brand and the fast fashion brand. Fast fashion powerhouses strengthen these connections by recreating the styling, colors, and design to produce the same high fashion look elite fashion designers were inspired by without infringing logos, patents, or trademark protected designs. This leaves high fashion designers left fairly powerless and unprotected by copyright laws. This all changed with the holding of Star Athletica, L.L.C. v. Varsity Brands, Inc., which provided high fashion designers with much more expansive intellectual property protection. In March 2017, the Supreme Court established a test for determining the copyright eligibility of design elements in fashion in Star Athletica, L.L.C. 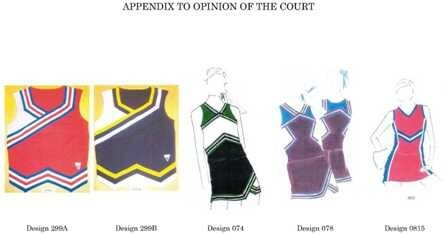 v. Varsity Brands, Inc. Respondent Varsity Brands, Inc. obtained more than 200 copyright registrations for two-dimensional designs that appear on their cheerleading uniforms. Respondent employed designers who sketched design concepts of uniforms consisting of “original combinations, positionings, and arrangements of elements which include V’s (chevrons), lines, curves, stripes, angles, diagonals, inverted V’s, coloring, and shapes.” 137 S. Ct. 1002, 1007 (2017). Respondent Varsity Brands, Inc. sued Star Athletica, L.L.C., a competitor that also markets cheerleading uniforms, for copyright infringement for using 5 of Respondent’s copyrighted designs. Id. The District Court granted the petitioner summary judgment holding that designs could not be conceptually or physically separated from the uniforms, and therefore were not copyrightable designs. Id. The Sixth Circuit later reversed this and concluded that graphics “could be identified separately and were capable of existing independently” of the uniforms under 17 U.S.C. 101. Id. Specifically, they found that the graphic designs were separately identifiable because “the designs and a blank cheerleading uniform can appear ‘side by side’ and . . . are capable of existing independently.” Id. The Supreme Court found these conflicting perspectives on the separability analysis warranted certiorari to resolve this widespread disagreement over the proper separability test. Id. A pictorial, graphic, or sculptural feature incorporated into the design of a useful article is eligible for copyright protection if it (1) can be identified separately from, and 2) is capable of existing independently of, the utilitarian aspects of the article. 17 U.S.C. 101. The Court focuses more on the second requirement, stating that the burden of proof for the first requirement is not that difficult to satisfy. See Star Athletica, L.L.C. v. Varsity Brands, Inc., 137 S. Ct. at 1010. The Court states that the trier of fact must determine whether the separately identified feature can exist apart from the utilitarian aspects of the article. Id. This means that it has to be able to exist on its own if its imagined independent from the useful article. Id. If it cannot be imagined separately from the useful article, then it is not a pictorial graphic or sculptural feature of the article itself, but rather as part of one of the utilitarian aspects of the garment. Id. The Copyright Act provides that the owner of the copyright can reproduce this work copies on any kind of article regardless of whether it embodies a utilitarian property. See 137 S. Ct. at 1005. The Court states that this is a mirror image of 17 U.S.C. 113(a) which protects an authorship fixed on some tangible medium that is non-utilitarian and then later applied to a utilitarian object. Id. On the other hand, 17 U.S.C. 101 protects the art that is first fixed in the medium of a useful article. Id. Accordingly, the Court holds that the copyright protection extends to pictorial, graphical, or sculptural objects regardless of whether they are affixed to utilitarian or non-utilitarian objects. Id. The Court held that this interpretation of the statute is consistent with a past holding in the Copyright Act’s history. Id. In Mazer, the Court held that the respondents owned copyright protection for a statuette that served as the base of the lamp and it was irrelevant if can be identified as a freestanding sculpture or lamp base. Id. The Copyright Office used the Mazer holding in the modern separability test to copyright law in section 101 of the 1976 Act. Id. Ultimately, the design of the uniforms satisfy the requirements of Section 101 of the 197 Act because they 1) can be perceived as a two- or three- dimensional work of art separate from the useful article; and 2) would qualify as a protectable pictorial, graphic, or sculptural work either on its own or in some other medium if imagined separately from the useful article. 137 S. Ct. at 1016. Based on this interpretation, the Supreme Court affirmed the Court of Appeal’s judgment. Id. Now high fashion designers can turn to this holding when any aesthetic design is affixed to a utilitarian design. 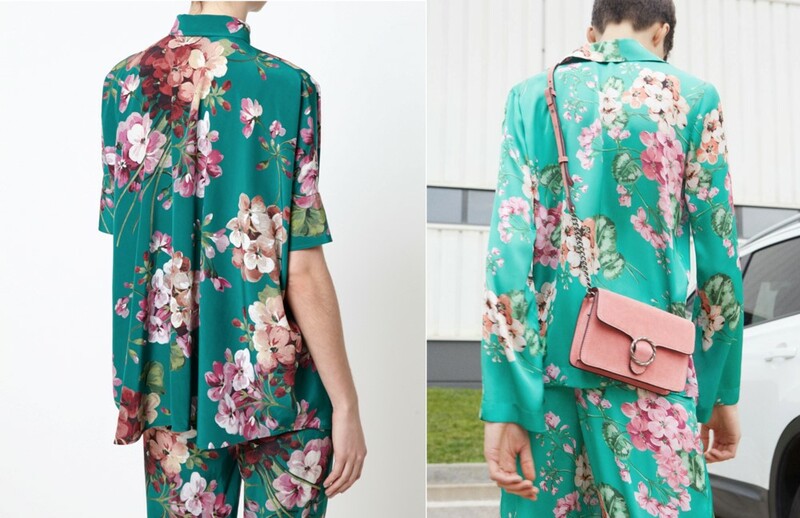 This holding has revolutionized high fashion designers’ intellectual property interests for their designs in the high fashion industry that is victim to fast fashion’s intellectual property theft. 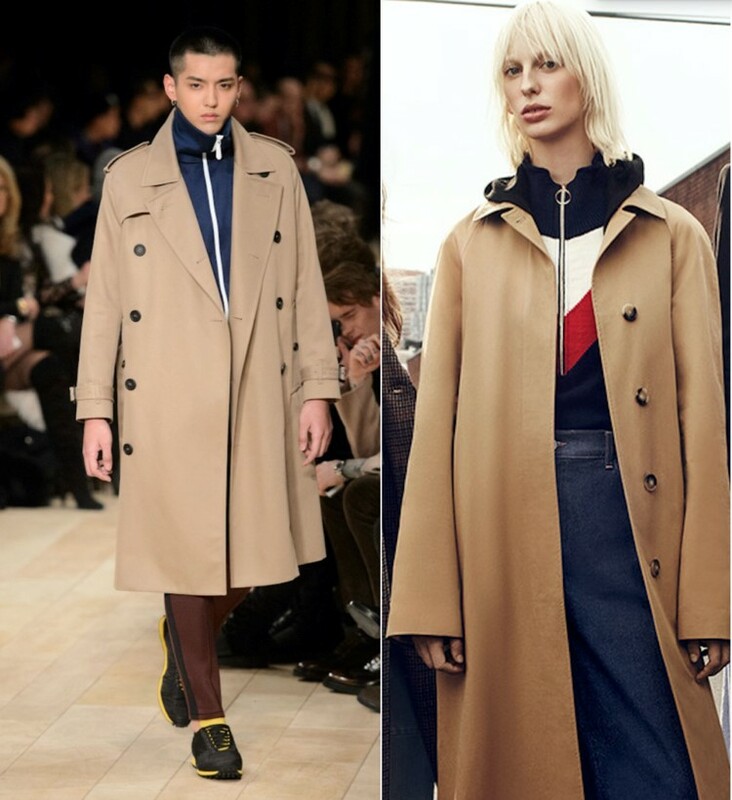 Author sewellnylawPosted on November 15, 2018 Categories blogTags Balenciaga, Burberry, copyright, Fashion, Gucci, infringement, intellectual property, litigation, Supreme Court, Zara3 Comments on The Fashionable Supreme Court: Will They Say Yes to the Trade Dress?